This is one of my favorite recipes of all time, originally taken from The Dean and Deluca Cookbook. This recipe has been tinkered with many times over the years — so much so that the glue-bound spine of the cookbook has cracked, making it fall open to pages 496 and 497 every time I pick it up. Now when I look at those scribbled-on, stained, dog-eared and water-wrinkled pages, I feel that this version here is very much my own. Though some might consider it not quite a pot pie — there is no bottom crust, only a top — the pastry blanketing the heavenly rosemary-scented filling is so flaky and satisfying that to quibble over nomenclature seems silly. Lately I have been adapting the recipe slightly as a way to cook up tasty bits of Thanksgiving turkey leftovers. I do love getting my fingers into the turkey carcass, stripping and pulling away every moist morsel left on the bones. This recipe makes the most of those wonderful little bits and pieces, but is also amazing as is with its freshly browned chunks of juicy chicken breast. 1. Put the flour, salt, and butter in a food processor and pulse until the mixture resembles coarse crumbs. Do not overprices as the chunks of butter cut into the flour is what makes the crust tender and flaky. While the food processor is running, add the water, a little bit at a time, until the dough begins to pull away from the side (do not let it form a ball). You might use less water than 1/4 cup, but probably not more. 2. Turn the dough out onto a lightly floured work surface. Working quickly and lightly, knead the dough with the ball of your hand until it comes together. Shape the dough into a ball and flatten it out into a disk. Wrap the disk in plastic wrap and refrigerate for at least 30 minutes, but no longer than an hour. 1. Season the chicken with salt and pepper. Heat 1- 1 1/2 tablespoons of olive oil in a heavy-bottomed pan over moderate heat. Add the chicken in batches, making sure all the sides are nicely browned. Set the chicken aside. 2. Add the remaining oil to the same pan along with the garlic, celery, and carrots. Sauté the vegetables until they are tender, about 6 minutes. Set the vegetable mixture aside. 3. In a small saucepan about halfway with water and bring the water to boil. Add the peeled pearl onions. Cook for about 5 minutes. Add the frozen peas to the boiling water and continue to cook for about 4 minutes more. Drain the vegetable and set them aside. 4. In a medium-sized saucepan, melt the butter over moderate heat. When melted, add the flour and mix quickly. Brown the flour lightly before adding about 1/2 cup of the stock. Whisk the stock into the flour, smoothing out any lumps before adding the rest of the stock, the milk, and the cream. Continue whisking while the mixture is brought up to a boil. Reduce the heat to low and continue to whisk while the sauce thickens to the right consistency. Turn off the heat and stir in the chopped rosemary. Adjust the seasoning. 2. In a large casserole or deep pie dish, spread the chicken out over the bottom. Spread the vegetable evenly out over the chicken and then pour the sauce evenly over everything. 3. On a lightly floured surface, roll the dough out until you have a round that will hang about 1 to 1 1/2 inches off the side of the dish. 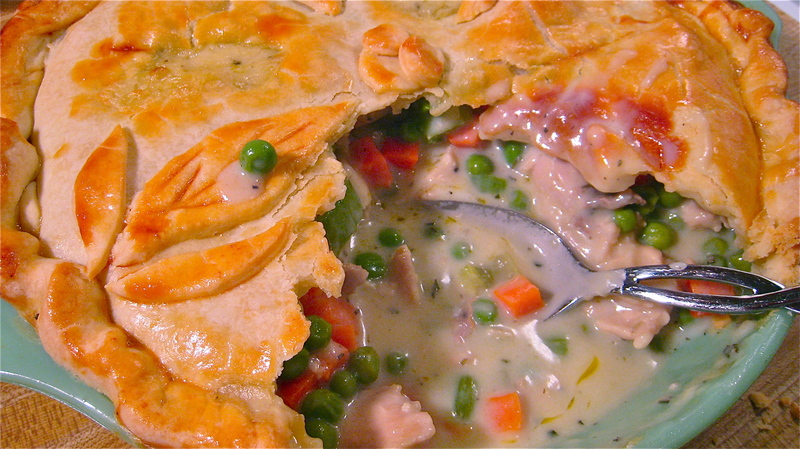 Place the dough gently over the pie and slightly tuck it in around the edges of the dish. Trim off any excess that falls more than 1 to 1 1/2 inches over the edge. Pinch or crimp the edges to make a decorative border. Using a knife, make a few slashes on the top of the pastry. If you have some leftover dough, you can also make some decorative leaves to go on top. 4. Brush the beaten egg on top of the dough. Bake in the oven until the crust is golden brown, about 45 minutes. Let rest at least 5 minutes (or even better, 10) before serving. For the filling, if you have any leftover roasted chicken or turkey, you could use that instead.